I've seen some ads on TV and online about the hand held fabric steamer and I was really thinking to have one. I think this is a handy companion in the house to think that some linens like curtains and blankets are really hard to straighten out using the ordinary flat iron. 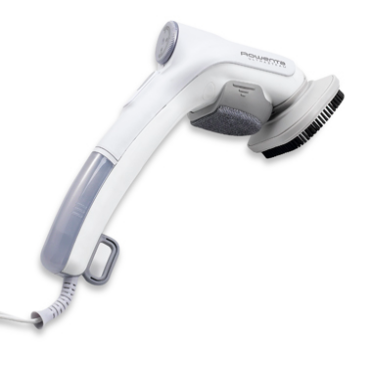 I've seen a lot of reviews saying that handheld fabric steamer is an effective tool in wrinkle removal. All you have to do is to hang the fabric and just move the fabric steamer up and down while it dispenses a continuous flow of steam. If you want, you can also use this for pants. The fabric steamer can be adjusted according to the right amount of steam that is suitable for the fabric type. I think this is worth a try. This also comes with a storage bag and can be brought along with you during your travels. However, this fabric steamer is available on various brands, so I suggest that before you purchase this, you must take time to read some product reviews online so you would be able to get the best brand available. So far, the Rowenta Handheld Fabric Steamer is the one getting good reviews. Better do a research first to get your money's worth. I think this is priced at about $30. I would certainly love to have one. This is the first time I heard of such product ate Krizza. Very useful to for mothers :) I miss you! Ako din, nami miss kita. Galing ako dun kay Rona, chumika. Hahaha! Yun yung namimiss ko eh yung ikutan sa blogs tapos chi chika. Hahaha! effective nga kaya 'to? na-cu-curious din ako dito. i was thinking of getting this kasi i think pwede din gamitin as steamer na cleaner yung ganito, although i'm not sure.